We love local! We want to celebrate all of the great food and artists who make great stuff in our local radius. From our farm in Carlisle, that’s been producing food for our community since 1945, to our partnerships with other great farmers and local suppliers, we are about continuing to source as much as we can within our radius. Our goal is to re-introduce you to an era when food and drink did not come pre‑packaged and tasted uniformly blah, but instead was masterfully prepared by a team that love to cook and aim to please. Where possible, ingredients are sourced from our community’s great farmers, including our own farm and craftspeople — and we believe that you can taste the difference. From farm fresh eggs and locally baked goods, to naturally grown seasonal vegetables, our chef takes what arrives that morning and makes beautiful food from it that day. Greater Hamilton is what we call “Our City” and we are proud to be a part of it! Hamilton is a city with more history than most in Canada, and we continue to gain recognition for making things, and not just steel… from world class science and medicine to motion pictures and art, music and more… We celebrate so many new and vibrant members of our community who are helping this city become great again, tweeting and meeting as we continue to dream about what is next! Radius has seating for over 340 guests, offers its patrons great foods, coffee and drinks made where possible from the produce and fine meats of our very own farmers and even from our own farm in Carlisle. We are able to serve you in a lovingly restored building once occupied by Isaac Buchanan, one of Hamilton’s great innovators of the 1800’s in a space that features 16’ original tin ceilings and adorned with art work from Hamilton’s great artist community. Our food is prepared fresh daily. I guess you could say that we ‘love local’. For casual dining with a twist, let our chef thrill you with an eclectic menu that changes daily depending on what our farmers have available… Ask us about private event space if you are planning a business or fun event. Our bar features over 20 lines of beer and we serve some of Ontario’s finest wines and offer regular tasting events. Radius is a proud supporter of CityKidz, a local charity focused on breaking the cycle of poverty and giving kids of all ages hope and teaching them self esteem. 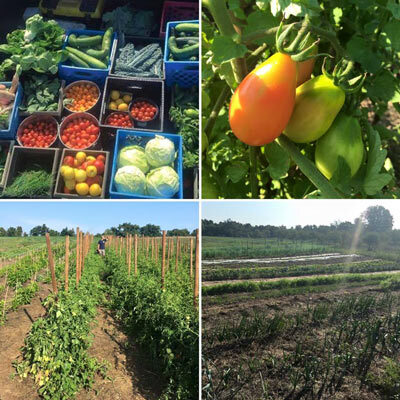 Each year, radius hosts over 200 volunteers at the farm for a day long picnic. We are proud to say that the first meal that we ever served was to all of the team at CityKidz headquarters for their Christmas Dinner on December 23rd, 2011 (yes, we were not even open to the public!). We are also working on creating projects for the kids to participate in the vegetables grown on the farm. So many of the CityKidz have never visited a farm or spent much time outside of urban Hamilton and are thrilled to be amongst the trees and fields and streams. We also hope to co-create other leadership programs for the volunteers leveraging the 110 year old barn on the farm.